This material (including line-art images and animations) is copyrighted! See my copyright notice for fair use practices. The Sun produces a lot of light every second and it has been doing that for billions of years. How does it or any other star produce so much energy for so long? This section will cover how stars produce their energy. Astronomers have known for a long time that the Sun produces a tremendous amount of energy. The first part of this section will try to give you an idea of how much energy it produces. Don't feel bad if you have trouble grasping the amount. It is mind-boggling! There are several ways to generate the amount of energy coming from the Sun. What distinguishes the correct explanation from the other models is how long it can power the Sun. The first basic question about the Sun is how bright is it? It puts out A LOT of energy every second. How much? The answer from our measurements is 4 × 1026 watts. Such a large number is beyond most of our comprehension, so let's put the Sun's total energy output (ie., its luminosity) in more familiar units. It is equal to 8 #215; 1016 of the largest power plants (nuclear or hydroelectric) on the Earth. Our largest power plants now can produce around 5,000 Megawatts of power. Another way to look at this is that the sun puts out every second the same amount of energy as 2.5 × 109 of those large power plants would put out every year---that's over two billion! What could produce that much energy every second? Let's first rule out other likely candidates. How about chemical reactions? The most efficient chemical reaction is combining two hydrogen atoms and one oxygen atom to make a water molecule plus some energy. Such a reaction has a very small ``efficiency'' (something like 1/66000000 of one percent). The efficiency = amount of energy released/(mass× c2), where ``mass'' is the total mass of all of the atoms involved and c is the speed of light. The amount of energy the Sun has stored = the efficiency × (the mass of the fuel source) × c2. To find out how long the Sun would last, you need to find out how much energy the Sun has stored in its account and know how fast it makes withdrawals on its account. The amount of time it would last is the amount of energy stored divided by the rate of withdrawal: lifetime = energy stored/consumption rate = E stored/Luminosity. Makes sense, yes? If the Sun could use all of its hydrogen to make water, the chemical reactions would only power the Sun for about 18,000 years. However, the amount of oxygen is much less than the hydrogen, so the chemical reactions can power the Sun for only 30 years. We need a reaction with a higher efficiency. How about the ultimate in efficiency---a complete matter to energy conversion with 100% efficiency. Such a reaction could power the Sun for 1013 years. Unfortunately, there are problems with this because the number of heavy particles (protons + neutrons) in the Sun must stay the same and protons are extremely stable---they don't spontaneously change into energy (photons). How about gravitational settling? This is a fancy way of referring to the converting of the potential energy of the falling layers to kinetic energy. When you hold a rock above the ground it has stored energy (``potential energy''--it has the potential to do some work). The stored energy is released as you let it fall. The rock gets kinetic energy because it is moving. Kinetic energy can heat things up. This is what would happen to the layers of the Sun if they were to fall inward toward the center of the Sun. The gas would be compressed and, therefore, would heat up. In addition to the expected heating, the gas would also radiate light. Until the beginning of this century, this was the idea physicists strongly argued for. This gravitational energy (with an efficiency of 1/10000 of one percent) could power the sun for 30 million years---a nice long time except for the nagging but ever louder criticism of the biologists who needed more time for evolution to occur and the geologists who preferred the idea of an unlimited age for the Earth but would stomach something like a few billion years for the age of the Earth. A good article on the age-of-the-Earth debate is in Scientific American August 1989 pages 90 to 96. Eventually, physicists had to change their minds about the age of the Sun (and Earth) as radioactive dating indicated a 4.6 billion year age for the solar system and, therefore, the Sun. It was the fact that the Sun could not last long enough being powered by gravitational contraction that motivated the search for nuclear power sources. Nuclear power is the only thing left to power the Sun for as long as it has been shining. There are two types possible: fusion and fission. They both transform the nucleus of an atom into another type of nucleus. Fission produces energy by breaking up massive nuclei like uranium into less massive nuclei like helium and lead. Fusion produces energy by fusing together light nuclei like hydrogen to make more massive muclei like helium. Atomic power plants and the Atom Bomb use fission to get the energy. Stars and Hydrogen bombs use fusion. To get the positively-charged nuclei to fuse together, their electrical repulsion must be overcome (remember that like charges repel and opposite charges attract---something that rarely happens in human interactions). Once the positively-charged nuclei are close enough together (within several 10-13 centimeters of each other), another fundamental force of nature called the strong nuclear force takes over. It is much more powerful than the electric force and makes the nuclei stick together. To get those nuclei close enough together requires high temperatures and high densities. At high temperatures the nuclei move fast enough to be driven close enough together for them to fuse. The high densities ensure that there are enough nuclei confined in a small volume for the collisions to take place at all. The only place these extreme conditions occur naturally is in the cores of stars. The temperatures in the cores of stars are above the approximately 8 million K needed to fuse hydrogen nuclei together. The amount of repulsion is larger for nuclei with more positive charge so the fusion of elements with greater positive charge requires greater temperatures and densities than that needed for fusing elements with small positive charge. This is why stars fuse hydrogen nuclei before they fuse other nuclei. For example, the fusion of helium nuclei requires temperatures above 100 million K and heavier nuclei require even higher temperatures. You will see in the next chapter that these ultra-extreme conditions occur in the final stages of a star's life cycle after the main sequence stage. Fusion involves low-mass nuclei whose combined mass is more than the resulting fused massive nucleus. The mass that was given up to form the massive nucleus was converted to energy. Remember E=mc2? That tells you how much energy (E) can be made from matter with mass m. Remember that c is the speed of light and it's squared (!) so a little bit of mass can make a lot of energy. In the cores of main sequence stars, four hydrogen nuclei, each with the mass of one proton, are fused together to form a single helium nucleus (two protons and two neutrons) that has a mass of 3.97 times the mass of one proton. An amount of mass equal to 0.03 times the mass of one proton was given up and converted to energy equal to 0.03 × (mass one proton) × c2. The efficiency of this reaction is about 4/5 of one percent. The Sun could last for about 10 billion years on hydrogen fusion in its core. This is plenty long enough to satisfy the modern geologists. The fusion process in stars is a little more complicated than what was described above. Rather than creating the helium nucleus in a single reaction, nature uses a series of reactions to build up the helium nucleus step-by-step. In most stars a three-step chain reaction is used called the ``proton-proton chain''. It is described in the animation below. Massive stars also use a reaction that uses carbon, nitrogen, and oxygen nuclei in a chain process, called the Carbon-Nitrogen-Oxygen chain, with several more steps. Regardless of the chain process used, the net result of the fusion process is to fuse four hydrogen nuclei (protons) to create one helium nucleus (2 protons + 2 neutrons) plus some energy. Three step nuclear reaction chain. Selecting the image will bring up a single frame that summarizes the chain reaction. Why does nature use a long complicated chain reaction process to fuse four protons into one helium nucleus? Would not it be much simpler if four protons would collide simultaneously to make one helium nucleus? Simpler, but not very likely is the answer. Getting four objects to collide simultaneously each with high enough energy is very hard to do---the chances of this happening are very, very small (as one from a family of 8 boys I can attest to the difficulty of getting just half of us together for a mini-family reunion!). The chances of this type of collision are too small to power the Sun, so nature has found a cleverer scheme. The chances of two particles colliding and fusing is much higher, so nature slowly builds up the helium nucleus. Nuclear fusion is something of a holy grail for utility companies because it produces no nasty waste products and has the potential of getting more energy out of it than you put in---free energy! Unfortunately, the conditions to get fusion to happen are very extreme by our standards. A major problem is containing the very hot gas for extended periods of time to provide a sustained energy source. We have been only able to tap the fusion process with the Hydrogen bomb, but that is a one shot deal. The Hydrogen bomb still needs an atomic bomb trigger to create the extreme temperatures needed for the fusion process. At least you can get the waste product of the Sun's fusion process for free with solar power collectors. The Sun can have a controlled fusion process and not blow up all at once because of the hydrostatic equilibrium ``thermostat''. Hydrostatic equilibrium is the balance between the thermal pressures from the heat source pushing outwards and gravity trying to make the star collapse to the very center. I will discuss hydrostatic equilibrium in more depth (no pun intended) in a later section. The nuclear fusion rate is very sensitive to temperature. It increases as roughly temperature4 for the proton-proton chain and even more sharply (temperature15) for the Carbon-Nitrogen-Oxygen chain. So a slight increase in the temperature causes the fusion rate to increase by a large amount and a slight decrease in the temperature causes a large decrease in the fusion rate. Now suppose the nuclear fusion rate speeds up for some reason. Then the following sequence of events would happen: 1) the thermal pressure would increase causing the star to expand; 2) the star would expand to a new point where gravity would balance the thermal pressure; 3) but the expansion would lower the temperature in the core---the nuclear fusion rate would slow down; 4) the thermal pressure would then drop and the star would shrink; 5) the temperature would rise again and the nuclear fusion rate would increase. Stability would be re-established between the nuclear reation rates and the gravity compression. A similar type of scheme would occur if the nuclear fusion rate were to slow down for some reason. The fusion rate stays approximately constant for stars that are fusing hydrogen to make helium + energy in the core. Once the hydrogen fuel in the core has been used up, hydrostatic equilibrium can no longer stabilize the star. What happens next will have to wait until I talk about stellar evolution. Need an energy source that lasts a long time: lifetime = energy stored/luminosity. Nuclear fusion is the only process that can do this. With nuclear fusion, lower-mass nuclei fuse together to form a single more massive nucleus + energy. The sum of the low-mass nuclei masses = the massive nucleus mass + energy/c2 (remember E = m c2). The ``c'' is the symbol for the speed of light. Nuclear fusion can power the Sun for about 10 billion years. To overcome the mutual electrical repulsion of positively-charged nuclei, a star needs extremely high temperatures and densities. These conditions are found only in the core of a star. Under these extreme conditions, particles move fast enough to get close enough for strong nuclear force to overcome electrical repulsion. Repulsive force increases with more positive charges. Hydrogen is fused first because it requires less extreme conditions, than the fusion of more massive nuclei. Stars use a chain process to fuse four hydrogen nuclei to create one helium nucleus. A chain process is much more probable than a process that fuses four hydrogen nuclei simultaneously. Most stars use a proton-proton chain that is described in the animation above. Stars with enough mass will also use the ``Carbon-Nitrogen-Oxygen chain'' process. The net process is the fusion of four hydrogen nuclei to make one helium nucleus plus some energy. The balance between gravity compression and outward thermal pressure controls the rate of the nuclear fusion reactions. The star does not blow up like a bomb. Helium is produced in the fusion of hydrogen. As shown in the proton-proton fusion chain diagram above, there are two other particles produced. One is the ``positron'' and the other is a ``neutrino''. A positron is the antimatter counterpart of the electron. It has the same mass as an electron but the opposite charge. When it collides with an electron, they annihilate each other converting all of their mass into energy. The photons produced in nuclear reactions take about a million years to move from the core to the surface. The photons scatter off the dense gas particles in the interior and move about a centimeter between collisions. In each collision they transfer some of their energy to the gas particles. By the time photons reach the photosphere, the gamma rays have become photons of much lower energy---visible light photons. Because the photons now reaching the surface were produced about a million years ago, they tell us about the conditions in the core as it was a million years ago. The other particle produced in nuclear reactions has a less tortuous path out of the core. A neutrino is a massless (or very nearly massless) particle that rarely interacts with ordinary matter. Neutrinos travel extremely fast---the speed of light if they have zero mass or very close to the speed of light if they have a small mass. Because they travel so fast and interact so rarely with matter, neutrinos pass from the core of the Sun to the surface in only two seconds. They take less than 8.5 minutes to travel the distance from the Sun to the Earth. If you could detect them, the neutrinos would tell you about the conditions in the Sun's core as it was only 8.5 minutes ago (much more current information than the photons!). The problem with neutrinos is that they have a very low probability of interacting with matter. A neutrino could pass through a light year of lead and not be stopped by any of the lead atoms! However, there are A LOT of neutrinos produced by the Sun. Take a look at your pinky finger. In one second several trillion neutrinos passed through your pinky (did you feel them?). Don't worry, the neutrinos did not damage anything. The great majority of neutrinos pass right through the materials around you. 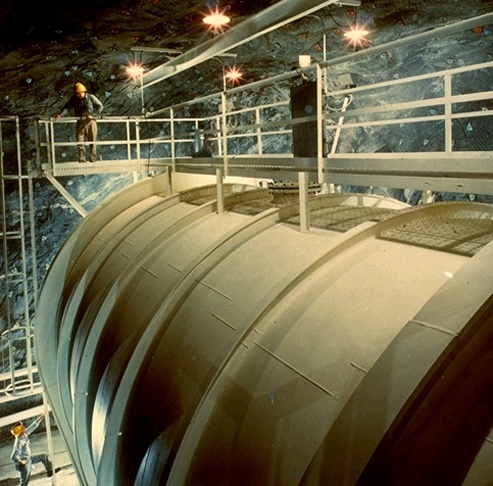 Homestake Gold Mine Neutrino Experiment (courtesy of R. Davis, Brookhaven National Laboratory). A few of them will interact with some matter on the Earth. You can increase the odds of detecting a few of them by using a LARGE amount of a material that reacts with neutrinos in a certain way. A chlorine isotope will change to a radioactive isotope of argon when a neutrino interacts with it. In the same way a gallium isotope will change to a radioactive isotope of germanium. Water molecules will give off a flash of light when struck by a neutrino. Neutrino detectors use hundreds of thousands of liters of of these materials in a container buried under many tens of meters of rock to shield the detectors from other energetic particles from space called cosmic rays. Even the largest detectors detect only a few dozen neutrinos in a year. 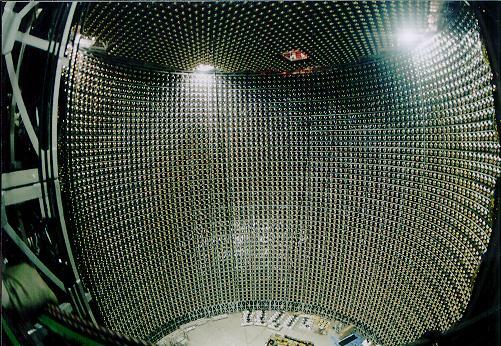 Super-Kamiokande Neutrino Detector water tank showing the thousands of photon detectors each about the size of a beach ball. Nuclear fusion is not the Sun's power source. This reason is not supported by other observations, so it is not likely to be the correct reason. The experiments were not calibrated correctly. It is unlikely that all of the carefully-tuned experiments were tuned in the same wrong way. The experiments have used three very different ways to detect neutrinos and have produced the same lack of neutrinos. The experiments have been independently verified by many other scientists, so astronomers think that the results are correct, even if they are disappointing. The nuclear reaction rate in the Sun is lower than what our calculations say. This is possible but many people have checked and re-checked the physics of the reaction rates. There are some strong constraints in how much you can lower the temperature in the core of the Sun to slow down the reactions. Astronomers know how much total energy is emitted by the Sun, so they know very accurately how many nuclear reactions are needed to produce all of those photons seen coming from the Sun. Those reactions also produce the neutrinos. Astronomers think they have a good idea of how stars produce their energy. That leaves another alternative. Neutrinos produced in the core of the Sun change into other types of neutrinos during their flight from the Sun to the Earth. Our neutrino detectors can detect a certain kind of neutrino, called the ``electron neutrino'', that are produced from nuclear fusion. Some of these electron neutrinos may change into another of two types of neutrino that do not interact with the detection material. This idea is gaining more and more advocates. Some experiments suggest that the neutrinos may be able to change into other types. New experiments are being constructed that will enable us to detect all three types of neutrinos. Stay tuned! A neutrino can change into another type of neutrino only if the neutrino has some mass. If the neutrino has mass, then it cannot travel at the speed of light, but can get darn close. Recent experiments have shown that the neutrino does have a tiny amount of mass (several million times less than an electron). A neutrino with even as small a mass as this has important consequences for the evolution of the universe (more about that later). It is amazing that in their effort to check their nuclear fusion theory, astronomers have learned totally unexpected things about fundamental physics and this has changed what is known about the structure of the entire universe itself. Wow! Here are some links to the homepages of neutrino ``observatories'' that are in operation around the world. The GALLEX detector uses Gallium in 30 tons of Gallium trichloride to detect neutrinos. It is buried far below a mountain in Italy. Their homepage also provides links to good summaries of the other neutrino detectors. 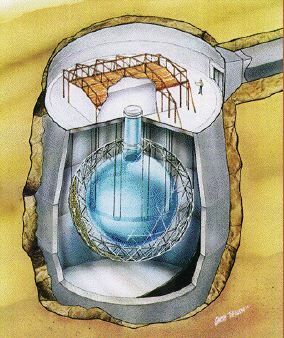 The Sudbury Neutrino Observatory uses 1000 tons of ``heavy water'' buried far below ground outside of Sudbury, Ontario (Canada) to detect the neutrinos. Heavy water uses the deuterium isotope of hydrogen instead of the ordinary isotope of hydrogen in the water molecule (H2O). Deuterium has 1 proton+1 neutron in its nucleus instead of just the 1 proton of ordinary hydrogen. The extra neutron makes deuterium twice as massive as ordinary hydrogen, so the ``heavy water'' molecule is about 10% heavier than ordinary water. Included at the site is a virtual tour of the SNO detector. The Kamiokande experiment in Japan uses 3000 metric tons of pure water to detect neutrinos. This detector was the first one that could determine the direction neutrinos were coming from. Also, it detected the neutrino burst from the supernova explosion SN1987A that was discovered in a companion galaxy to our Milky Way galaxy. A follow-up to the Kamiokande experiment is the Super-Kamiokande experiment that is a joint-project of the United States and Japan. The detector will use 50,000 tons of water buried deep underground in Japan. The link takes you to the United States homepage at the University of Washington. The University of California at Irvine is also involved in the project. John Bahcall has probably contributed the most to our understanding of the properties of solar neutrinos and what they tell us about the Sun's core and fundamental physics. Select his Solar Neutrino viewgraphs to see his presentations on the solar neutrino problem. Links to articles and talks for the general public are also available there. The University of Pennsylvania Physics Department distribute an excellent set of articles about neutrino physics and detectors.